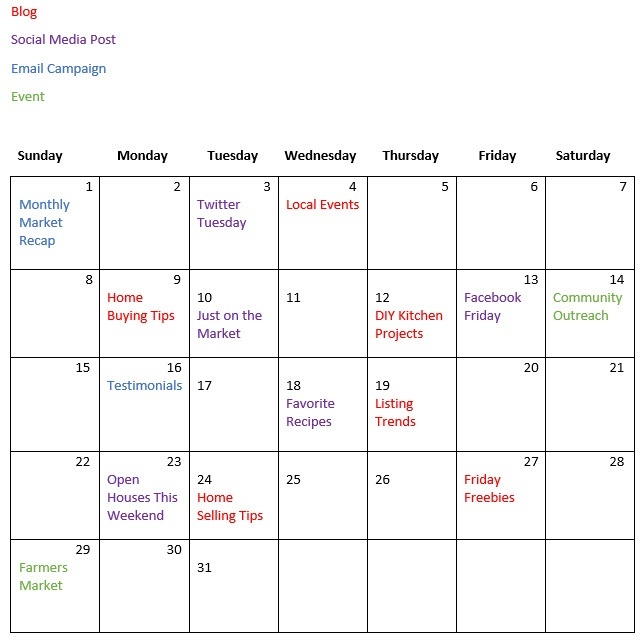 I know what you’re thinking - you already have a calendar, so why do you need a real estate marketing calendar? It’s simple - a marketing calendar helps you keep track of all of your marketing efforts in one place. As a real estate agent, you have a lot of things going on at any given time so maintaining a marketing calendar can help keep you organized and on top of the growth of your business. Every effective real estate business is organized. Hopefully, as a real estate agent, you are using a calendar to keep track of your meetings. By having a marketing calendar as well, you are able to keep track of your marketing efforts in one place that is separate from your client meetings. Additionally, you can share the calendar with your team, without sharing other private information. Putting all of your tasks into a calendar enables you to prioritize the importance of your tasks. Which tasks have deadlines that are sooner than other? Creating a visual representation of importance will allow you to keep your marketing strategy on track so that your business can grow. If you are unable to effectively prioritize, your business is going to suffer. Try color coding different tasks. This will allow you to differentiate between when a blog needs to be posted or. scheduling a social media post based on color. Make sure you have a key somewhere on your calendar so there is no confusion about what a certain color means. This will also eliminate confusion if you hire an assistant to assist your marketing efforts. Are you noticing that you are not getting as much from your social media marketing as the other strategies you’ve implemented? Look at your calendar and see if it’s time to beef up your content or increase the number of times that you are posting. Maybe you just aren’t spending enough time engaging with your fans. Schedule some extra time if necessary so that you can get the most visibility possible from your marketing strategy. If you can’t track the success of your marketing, how do you know that it’s growing? Is your marketing strategy effective? Using a marketing calendar allows you to look back on what you have done in months past when you have seen better results. Maybe you saw an increase in leads that came in the month of July, but you can’t remember what you did differently. By having a marketing calendar, you can look back and see exactly what you did, and show others as well. The better the records you keep are, the better it will be for your business. No matter if your business is small or large, having a marketing calendar can help you keep track of your marketing strategy and keep you organized. Do you want to automate your social media marketing? Let us help!